Could I ever move beyond this? Would I ever be free again? There is no hope for me….Crushed in my empty dream. Collapsed in my body, weak. Believed in lies that I had seen. Lost in life so shadowed, bleak. I felt as though all was lost, all was empty, and somehow in the shuffle, all had become nothing. Fallen dreams to the floor. Little voices calling out Say “Give up, confirm your doubt! You’ve done this before. You’ve fallen this way.” So, you try to give up once more. And the pain is deep, because hadn’t I fallen into this same dark place over and over again? Hadn’t I had the constant thoughts on replay grating on my sanity, ripping away at life, leaving me for nothing? Why couldn’t I just give up and let the darkness of anxiety pull me under…for good. I sat broken on a piano bench. Dry-eyed, I loudly scream. The sky has made my tears for me. Hollow weakness ripping through. Weakness, the strength I never knew! Oh, how I remember this! You cannot omit emotions from the Christian life. Life is raw and uncut, and it demands to be lived. A hope-filled heart is surrendered to God over and over again, but on that day, I felt tired and though it was time to give up the fight for truth. I was pulled beneath the weight of darkness. I sat broken on a piano bench, and I pleaded with my heart to keep on going. 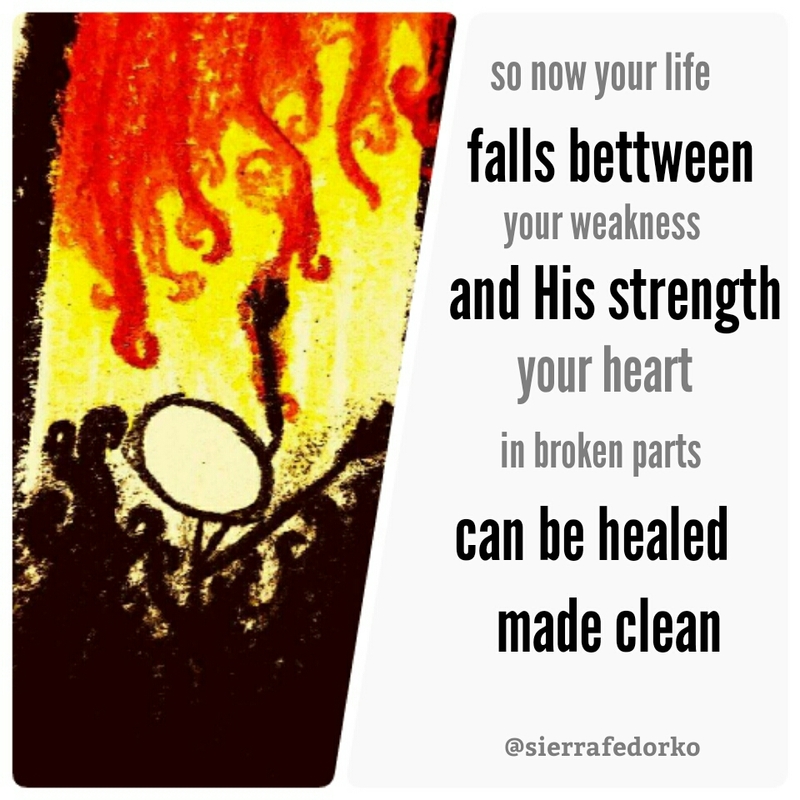 So, now your life falls between Your weakness and His strength. You heart in broken parts. Can be fully healed, made clean. The joy of hope did not come raining down on me. The struggles didn’t disappear. The fight on anxiety lurked all around me, but I had resolved to give over my weakness and in the giving over, I realized God’s strength would take its place. Many know that I have struggled with this kind of darkness. Sometimes, I struggle for months at a time. One small thought becomes many, many more. And they become darker, scarier, and more shameful as they progress. But I have learned that God truly does give grace upon grace! And this grace is unlimited. It is showered upon me in the darkest of nights, in the blackest of thoughts. I don’t have to sit broken on a piano bench forever! When I think I am unreachable, that I have passed the point of no return…I am urged to meditate on Truth and the Truth of God’s love-filled promises bring me clarity, and this clarity reminds me of hope, and this hope aids my victory, and these small victories give me seconds of joy, and those seconds become minutes, and the minutes hours. As I continue in my fight for Truth, the hours of joy, become days, the days flow into weeks and the weeks break into months! And then I experience the beautiful gift of a year where healing has poured into every crevice of my once-dark heart and God has made me like new! I don’t have to sit broken on a piano bench forever. I have no idea what kind of darkness you are facing today. But I do know I have felt just as black and hopeless as you have, but we are not unreachable. With God’s grace, the black washes out of our hearts and our minds…and we can learn to laugh and sing for Him again. For a time, we may feel cracked and empty sitting on a piano bench, but we don’t have to stay here. God will lead us out and up into life when we choose Him while sitting in this crushed and dry place. God can heal us though we are convinced we are unreachable, and have thought the unthinkable, and have done the unimaginable. Nothing is too hard for God, and we cannot be separated from the power of His love. We don’t have to sit broken on a piano bench forever. This darkness does not get to swallow us, because we know the great Victor who enables us to be valiant and victorious warriors.